Toyota fulfilled its promise, delivers brand new truck to nurse who saves lives in California fire - AutoReportNG "AutoReportNG-The No 1 Car Blog In Nigeria That You Can Trust - AutoReportNG"
Aftermath of the California fire, Toyota fulfills its promise. Allyn Pierce evacuated patients and staff from Adventist Health Feather River hospital, where he works as a lead nurse in the intensive care unit, the morning the Camp Fire broke out. When he was attempting to leave Paradise himself, he became trapped in gridlock on the way out of town and thought he wouldn't make it. Thanks to a miracle, a bulldozer arrived and cleared a path for Pierce and the other drivers. But rather than leave, he returned to the hospital to help newly arrived patients. 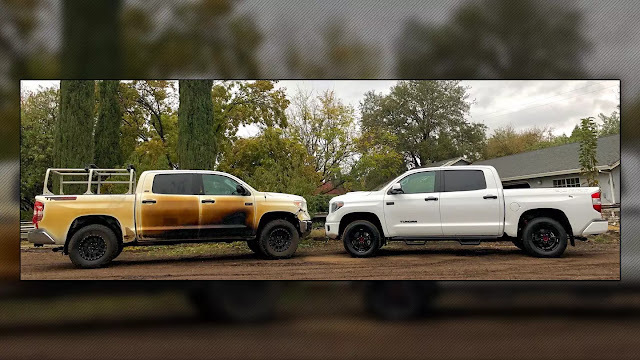 Pierce credited his Toyota Tundra truck with saving his life, posting a photo of the charred side of his vehicle, which he nicknamed The Pandra, to Instagram. "This truck literally saved my life today," Pierce wrote. "My little town of Paradise was literally burning down around me and @the_pandra got me to safety where I could help others...twice." "Today @toyotausa let me see the people that stand behind the logo," Pierce wrote. "There were handshakes, conversations, and hugs. The sincerity and compassion that's been shown by this company was demonstrated all the way down to a human level." 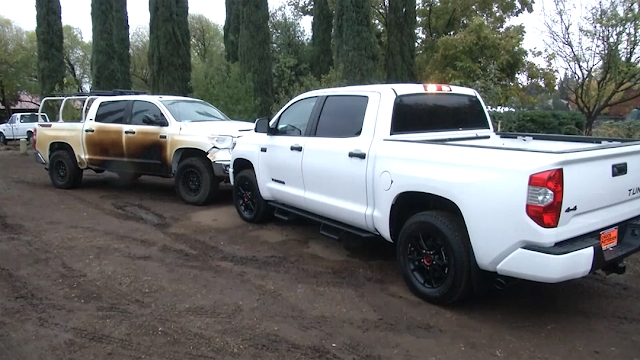 Toyota offered to take Pierce's burned truck to place on display in its showroom to show off the truck's durability.